Drew Dolezal, left, and Kyle Krula. It all started because of a broken ankle. With senior Eli Vosler missing the original Homecoming dance because of a football injury, some of his classmates decided to put on an unofficial second dance at the Morse Bluff Legion Hall. 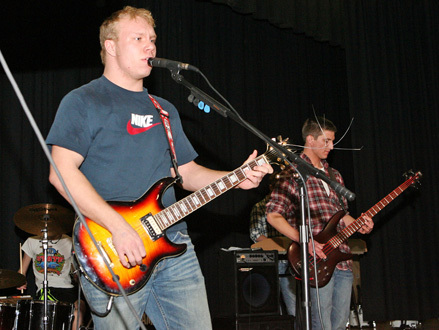 Three of Vosler’s classmates, Eric Kloke, Drew Dolezal and Kyle Krula, as well as freshman Luke Dolezal, provided the music that night. With Drew Dolezal on lead guitar and vocals, Kloke on drums, Krula on bass and Luke Dolezal on the keyboard, the quartet rocked the night away as their schoolmates danced along and parents looked on. The “Homecoming 2” event last November was just what the band needed to get kick started. The idea of forming a rock band wasn’t a new one. The three senior classmates had tried to start a band in junior high, but effort quickly fizzled due to their inability to drive. 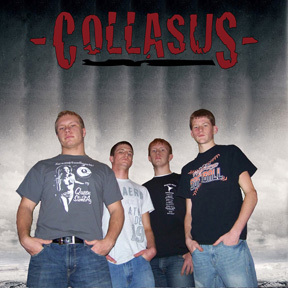 Collasus is Drew Dolezal, lead guitar and vocals; Kyle Krula, bass; Luke Dolezal, keyboard; and Eric Kloke, drums. Drew Dolezal started playing the guitar in sixth grade, taking lessons from then-band teacher John Cooper. With Dolezal on lead guitar, Krula decided to take up bass. Kloke, who had been playing percussion since fifth grade, took up the trap set in junior high. Once the group could drive, they trio began meeting before school in the band room to jam together. NBC band director Ray Kirkpatrick let Krula and Dolezal break out the guitars for several songs during pep band performance at Tiger games including “Killing in the Name Of” and “Bulls on Parade” by Rage Against the Machine and “Frankenstein” by the Edgar Winter Band. Kirkpatrick also encouraged the group to start playing outside of the school’s pep band. The band’s first true public performance came in a January gig at Dodger Bowl where they played in front of a packed house. The band, which eventually settled on the name Collasus, also played at halftime of an NBC basketball game and at NBC’s Snowball dance, and even during a church service at the United Presbyterian Church. While the small performance are helping them get their legs under them, the band is hoping its breakout performance comes during Old Settlers. Collasus will be playing in the Dodger Bowl beer garden Saturday night of Old Settlers in front of what will likely be it’s biggest audience yet. Dolezal said the band is ready for the opportunity. All four members said they are excited for the opportunity to play Old Settlers and hoped it would lead to further bookings. The band also plans to debut a few original songs it has been working on. Collasus’s set list, which included just 12 songs at that first gig in November, is now up to about three hours worth of material. The band draws heavily from ‘90s alternative rock, including bands such as Rage Against the Machine and Nirvana. The band also likes to mix in some older and newer stuff. One of the crowd favorites has been Dolezal’s performance of Lynyrd Skynyrd’s “Simple Man” from 1973. As the three recent graduates head off to college - Dolezal and Krula to Northeast Community College in Norfolk and Kloke to Wayne State - they hope to continue playing and booking bigger and bigger performances. Dolezal said he hopes Collasus will have staying power as the members go their separate ways this fall. After all, everyone in the band had bought new equipment in the past six months. The band realizes small town Nebraska, where the scene leans more towards country music bands, can be a rough place to start a rock band. However, it is once such country music band that gives them hope. Dolezal said Collasus hopes to follow in the footsteps of Dylan & the Dirt Road Detour, another North Bend band that has started to getting radio play (featured in last week’s Eagle).